The two leading Brexiteers gave keynote speeches at an exclusive Mines & Money conference in London last week – as communities whose livelihoods, health and environments are being destroyed, protested outside. Where were Nigel Farage and Arron Banks last Tuesday (28 November)? The former UKIP leader, and the Brexit donor and mining investor, were busy delivering keynote speeches on the first day of London’s exclusive three-day Mines and Money conference. The Mines and Money conference is an international affair with events in Toronto, Hong Kong, Melbourne and New York. The events bring the money-makers and the mining world together to attend seminars, network and make deals that affect communities across the world. As the world’s financial hub, the UK capital hosts one of the largest events, with 2,000 mining representatives and investors paying £1,895 to attend. This year’s panels included topics on building back reputation after a crisis, emerging markets and rounded off on Thursday 30 November with a Gala and Awards dinner, for a £500 price tag. Mining-impacted communities were not invited to the Mines and Money conference. But some community leaders came anyway, hosted by UK solidarity organisations including War on Want, The Gaia Foundation and London Mining Network, to challenge the conference and share alternatives to mining. A week of counter-events called Rise, Resist, Renew: Alternatives to Mines and Money took place. It included a lunchtime protest against the presence of Farage and Banks on 28 November, followed by a ‘Toxic Tour’ of some of the mining companies listed on the London Stock Exchange and an evening vigil on 30 November. Camila Mendez from youth collective COSAJUCA in Colombia and Clemente Bautista from Kalikasan People’s Environmental Network in the Philippines spoke about the resistance of their communities to London-linked mining companies. Online, activists and groups hijacked the Mines and Money official hashtags, #MinesandMoney and #MMLondon17, to disrupt the conference’s social media messages with alternative memes, photos and messages of their own. At bus shelters near the Business Design Centre venue in Islington, brandalists covered advertising space with subversive messaging. 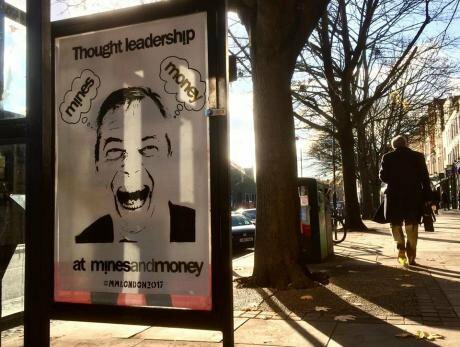 Posters included the text: ‘Land + Water = Life, Mines + Money = Death’ and depictions of a laughing Nigel Farage under the heading ‘thought leader’. The conference’s choice of keynote speakers was a controversial one. Arron Banks is a businessman and is involved in diamond mining operations in South Africa. He was named in the 2016 Panama Papers and the recently released Paradise Papers. The multimillionaire is currently under investigation by the Electoral Commission while they establish if he broke the law for bankrolling Brexit: he donated and loaned £8.4million to the Leave.EU campaign that he chaired in 2016. Before turning to politics, Nigel Farage was a commodities trader on the London Metal Exchange. Since resigning as UKIP’s leader for the second time last June after the UK voted to leave the EU, he has become a political analyst for American television network Fox News. He was asked to speak at the Mines and Money conference about Brexit and Trump. ‘I don’t know what they were thinking, inviting Farage’, a young delegate told me, stopping to chat as the 50-person strong protest took place against the right-wing leader, while trying to avoid being filmed. ‘It gives our industry a bad name, we’re not like that, it’s, well, complicated’. As the global switch from fossil fuels to a metals-based energy system gathers pace, the mining industry is responding to this by attempting to wrap its activities ever more tightly in the language of corporate social responsibility and job creation. Mining companies such as BHP are coming out as world leaders of the battery-powered vehicle revolution; greenwashing the mining industry while they herald lithium, cobalt and nickel as the answer to dwindling oil reserves and petrol-guzzling cars. But in many communities, particularly in the Global Majority, mining is one of the most tangible manifestations of neoliberalism, bringing with it displacement, destruction and death – with locals rarely seeing any of the wealth generated from resources siphoned off their land. Resisting mining giants can be deadly. Mining remains the world’s bloodiest industry for those who oppose it, with 200 environment and land defenders killed in 2016. Brazil, Colombia and the Philippines top the list for the most dangerous places to be a defender. Camila Mendez lives in Cajamarca, a small town in central Colombia. It is surrounded by strategic ecosystems and fog forests, fauna, flora and rivers. Many people are farmers. La Colosa gold mine is in Cajamarca. Owned by South African company AngloGold Ashanti, listed on the London Stock Exchange, explorations began in 2007. It has the potential to become one of the largest gold mines in the world. Over the past decade, the Colombian government has allocated 87 percent of Cajamarca’s territory to mining activity. But farmers and other members of the community have rejected La Colosa because it threatens the health of local people, the destruction of forests and the eradication of traditional agriculture. They also say that the mine is highly polluting and helps perpetuate social and environmental conflict in the area. In March, a public referendum was held in the town and residents almost unanimously rejected AngloGold Ashanti’s mining operations, with 98 percent of those who voted, casting their ballot against La Colosa. The results of this consultation are binding according to Colombian law, but shortly after the results were announced, the government’s mining minister German Arce stated that the company had already been granted an exploration license and that it was not to be revoked. Speaking at the counter events in London, Camila Mendez said that Cajamarca’s referendum was a vote against mining and a vote for agriculture, nature, water and life. ‘Our people have spoken, our community has expressed in every possible peaceful means that we reject the project’, she said, outside the headquarters of AngloGold Ashanti on the Toxic Tour that included stops at mining companies such as Vedanta and Rio Tinto. ‘The people of Cajamarca, no matter what happens, cannot be sold, and they will continue to fight because our true wealth is agriculture, it is not mining’, added the frontline defender. Clemente Bautista works with people who are affected by UK-linked mining projects in Philippines. Kalikasan PNE has already successfully forced large mining companies such as Glencore and BHP to pull out of the country. But many mining companies listed on the London Stock Exchange are still operating in the country, and resistance to them is becoming riskier under President Rodrigo Duterte. Metals Exploration Ltd owns 85 percent of the Runruno gold mine in the Nueva Vizcaya region of Luzon in Northern Philippines. The company operates the mine via a local company called FCF Minerals Corp. In 2012, FCF Minerals Corp demolished communities during the construction of Runruno mine, injuring at least six villagers in the process. Opposition from the community continues to be met with violence and human rights abuses. Batangas Gold, also in Luzon, is co-owned by London-listed mining company Bluebird Merchant Ventures Ltd and Australian corporation Red Mountain. Local resistance to the project has been meant with harassment, violence and arrests. The attacks against environmental defenders in Batangas have intensified this year, say Kalikasan PNE, in an attempt to push mining projects through and intimidate activists. ‘The mining investment in our country is not good for the Filipino people, it only creates more human rights violations and widespread environmental degradation’, said Clemente Bautista, outside the Mines and Money conference venue. Camila and Clemente were denied a voice inside the Mines and Money conference. But their message to London-linked companies and to figures such as Banks and Farage is clear and determined. Camila Mendez: ‘From here in this place [London] where there’s so much money, I want to say to the people, to the investors, that they can’t eat money and they can’t eat gold’.